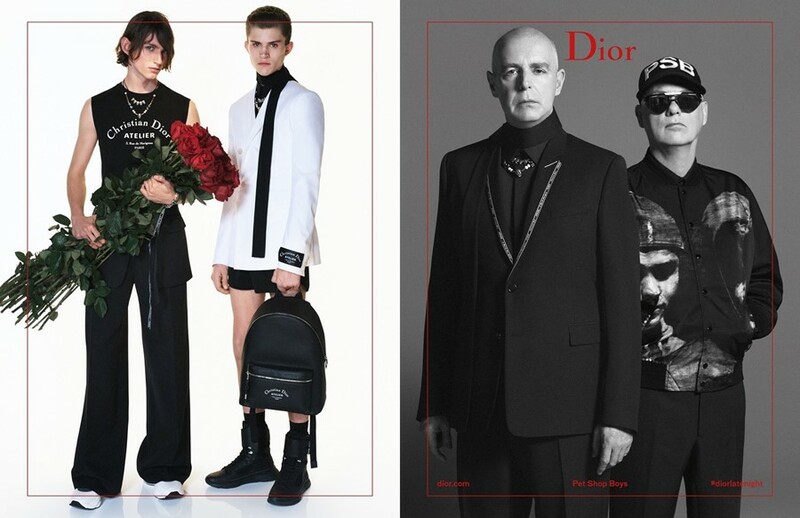 For a while now Dior Homme’s artistic director Kris Van Assche has been hinting at his love for 80s music. First, he enlisted Boy George for the label’s SS17 campaign, then came Depeche Mode’s Dave Gahan for AW17. Now, the designer has picked the Pet Shop Boys to front the newly released SS18 campaign. Photographed by David Sims, the synthpop duo – made up of Neil Tennant and Chris Lowe – feature in the images wearing clothing from the newest collection. In addition to a collaboration with French artist François Bard, the SS18 show also doubled up as Van Assche’s tenth anniversary at the house. Elsewhere in the campaign is American actor Charlie Plummer, who has made appearances in films like King Jack and All the Money in the World. Not to mention a trio of new model faces too. If, like Van Assche, you’re a fan of the Pet Shop Boys, they also provided the soundtrack for the campaign video that looks like it came straight out of the 80s. Featuring the 1988 single “Heart”, it sees the models (and the music duo) posing with bunches of flowers, with some retro graphics thrown in for good measure.